Inspirare unveils their fourth and most prolific issue of Inspirare Magazine, showcasing the ever-changing, inspirational faces of fashion, beauty and music. After much preparation and time, Inspirare released their fourth issue of Inspirare Magazine last week. Since nothing compliments fashion better than beauty and music, Inspirare fused all of these features together in their August issue to satisfy everyone’s thirst for creativity and expression. The latest magazine is filled with exciting features from celebrities, Inspirare online shop designers, fashion bloggers, models, tips, trends and much more. 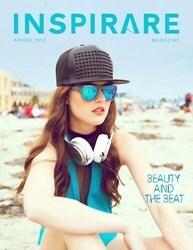 Inspirare Magazine is the perfect destination for the fashion or beauty conscious, who appreciate new styles and unique clothing. In this exclusive addition, Inspirare Magazine has a music theme for those who are musically inclined, featuring interviews with musicians and noteworthy items. The magazine is a stage where different styles of inspiration meet expression, offering readers the chance to be inspired inside and out. The Inspirare team collaborates to conduct a comprehensive search in order to display the finest products and only interview top-notch fashion industry professionals. Operated by a broad spectrum of highly qualified experts, the team takes the time to research and specially handpick an array of talent, chosen with the expertise of the editors and CEO. Executive Editor, Adrienne Glenn hopes to continue to spread her “love of fashion like an infection; showcasing all the sides of beauty, clothing and enlivening intellect throughout the thoughtfully crafted pages of Inspirare Magazine.” The last issue reached over one hundred thousand readers, from over fifty countries, showing the true potential of Inspirare on a global scale. The Inspirare Designer Shop discovers emerging fashion designers to showcase worldwide. The fashion is empowered by the consumers because they vote, share and buy this exclusive, innovative fashion. Inspirare uncovers new generations of talent, nurtures their creativity, spotlights their collection and helps them gain exposure to reach their target consumers. The designers are connected with a highly qualified, professional group comprised of fashion, retail and business experts. It also offers connection between the customers and designer directly, enabling designers to form a solid foundation to launch their label. The store is stocked with high quality, diverse, unique products, ranging from jewelry to dresses and much more. At Inspirare they keep strong contact with the designers as they produce blogs, videos and social media mentions about each individual designer as well as their products. Customer support and consistent quality is essential for an easy and pleasant shopping experience. Inspirare believes that fashion should always be easily accessible to anyone and everyone.